Grab the FREE ‘400 Calories or Less’ App for great handpicked recipes for Summer Fun, Kid Friendly Food, Holidays and Entertaining and Dinners from Around the World. If you love it, grab the full versions. Get it HERE !! And I sure appreciate your leaving a review over at iTunes. 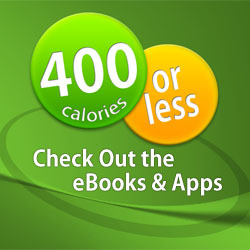 Get the ‘400 Calories or Less’ App and eBooks now ! 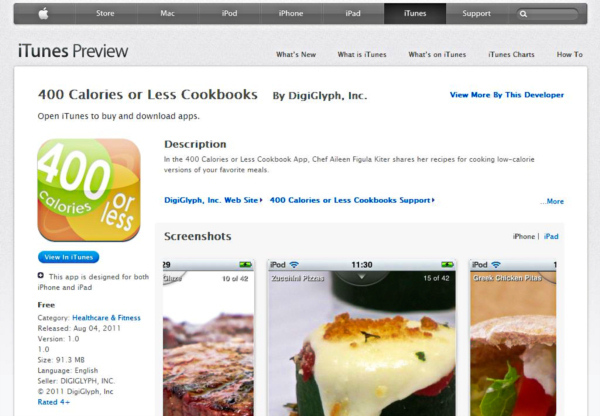 I’m so very pleased to announce the 400 Calorie or Less App and eBooks ! The eBooks are now available for the Nook and the Kindle. There are 4 eBooks and they each host 40+ recipes to help you lose weight while eating the foods you love and crave. The iOS App is all-in-one and is free to try, so get it while it’s hot !! In the Kid Friendly Cookbook, you’ll learn low calories variations to kid friendly classics such as recipes for sloppy joes, grilled cheese sandwiches, chicken bakes and fettuccine alfredo. In the Summer Fun Cookbook, you’ll find recipes for grilling favorites, salads, sweets, and delicious drinks that are perfect for summer. Whether you’re planning to relax by the pool, host a party, or have a picnic, the Summer Fun cookbook has you covered. In the Around the World Cookbook, travel the world without leaving your kitchen – or losing track of calories with recipes influenced by Asian, Mediterranean, Mexican, Italian and American cuisines. This next holiday, there’s no need to add another notch in your belt. In the Holidays Recipe Cookbook, you will find healthy adaptations of classic holiday recipes fit for entertaining and satisfying the most indulgent guests. Use this link to find out more information and to get your copy. Thanks for all your support and I hope you enjoy the publications.